If your home's windows are beyond repair, replacement windows can improve your home's appearance—adding curb appeal—and help reduce the energy costs of heating and cooling your home. Replacement windows, sometimes referred to as retro-fit windows, are custom-made for your home so your individual needs can be addressed. Typically, energy-efficient windows are made from low-maintenance vinyl, which is better at insulating against heat and cold than older aluminum units. 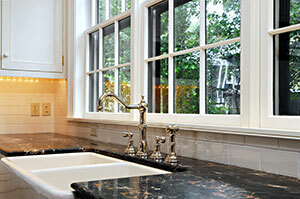 Replacement windows with dual- and triple-paned glass help reduce noise levels by blocking outside sounds. Specialized glass coatings and tints are used to keep heat from passing through the glass. Dense gasses, such as Argon and Krypton, can be injected between the glass layers to make the windows even more energy efficient. These features not only help keep your home insulated, but also protect your furniture, carpet, and window treatments from fading under the harsh ultraviolet rays of the sun. Since replacement windows are made specifically for your home, installation should be quick and painless, with no damage or alteration to the structure itself. The glass from your existing windows will be removed, and the replacement windows will fit snugly into the existing window frames. Installation for the entire house can usually be done in a single day by an experienced installer.